There was stone work everywhere in the Spanish Pyrenees. Descending into the French village of Bagnères-de-Luchon after cresting the Col du Portillon pass at the Spanish-French border was surreal. For about 10 days we'd been soothed by the rustic charm of the stone buildings and bridges in the Spanish mountain villages and felt jangled by the more rickety-looking old spa town on the French side. It was like wandering through a cozy mountain chalet and stumbling into a brightly lit room decorated in a faded Louis the XIV style. 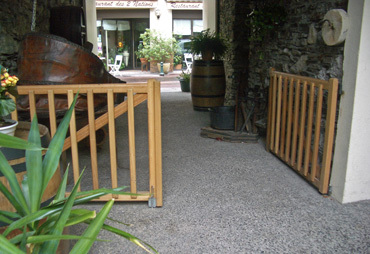 Our last stop in Spain at Vielha had been typical of our experience in the Spanish Pyrenees. The rough-hewn stone of the old town was tastefully extended into the new clusters of condos and businesses, with the main visual difference between the 2 eras being the larger number of newer buildings. The 2 and 3 storey structures of warm gray-brown rock were accented with stained wood trim and balconies. These once remote, centuries-old villages were being transformed into ski resorts in a kind and respectful way and we found the ambiance welcoming and comfortable. And we'd loved our string of Spanish ski resort hotels and B&B's that were modern and tastefully decorated, whether in new or old stone buildings. Their prices were deeply discounted for the low part of summer season and storing our bikes securely inside was never an issue--all we longed for was air conditioning on the hot afternoons. 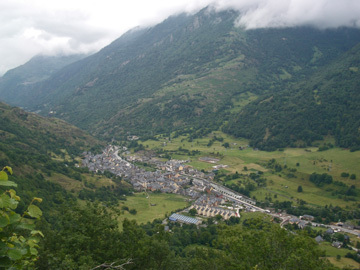 Going from Vielha into Bagnères-de-Luchon's town center was a reversal in the direction of energy: Vielha felt fresh and vital but with deep roots in the past; Bagnères-de-Luchon felt like it was crumbling and receding into a faded past. We had the same impression in France before where the attitude seemed to be that if it was good once, that was good enough. It often seemed in France that the visitor was expected to savor what once was, not what is. We however are more pragmatic and less romantic and go with our experience in the moment, especially when it comes to the comforts of lodging. Bagnères-de-Luchon: we declined this "secure" bike storage. That French "Look to what it once was, not at what it is" attitude seemed to include the plumbing at this our first French Pyrenees destination. I made a beeline to wash my hands in our Bagnères-de-Luchon hotel room sink and in moments I noticed the drain water splashing on my feet. No doubt it was right once, and that "should be good enough" seemed to be the message. A few minutes later Bill announced "There is no getting away from the leakage problem: the bidet leaks too." He'd switched to washing his clothes in the bidet to avoid the leaky sink drain only to discover that he was still going to be mopping the floor. So it was back to the sink, keeping the sturdy plastic bag strategically positioned under the pipes. Our Lonely Planet France guide book was much kinder than I and described Bagnères-de-Luchon as "a trim little town of gracious 19th century buildings". Perhaps we would have had a similar reaction had we approached it after weeks in France; perhaps we would have then found the Spanish mountain style too spare but as it was we were already looking forward to being back in Spain. Our first glimpse of the Bagnères-de-Luchon main street where the sidewalk vendors seemed to be taking their cues from the carnivals warranted a closer look but my attention was instead turned to the welcome, scalding-hot water in our tub. Bagnères-de-Luchon is an old 'therme' or spa town and by all rights I should have headed for the healing waters of the spa building. But I was chilled to the bone and the additional planning that a dip at the spa would require was more than my dulled brain could manage. We'd been riding for several weeks in the heat--sometimes into the 90's° F--and struggled to sleep some nights in rooms that barely cooled at all. So it was quite a shock the day we rode from Vielha, Spain to Bagnères-de-Luchon to have it top out in the 50's. The chilled air pouring through our open window when we awoke in Vielha was startling and we quickly closed up the room to retain the remaining warmth. Previous mornings our room often had been in the mid-70's by 7:30 am. We scrambled to extract wool and Goretex wear from the musty dark corners of our panniers knowing that we'd be contending both with the cold and the rain that riding day. But we were in luck: our pokey start had outlasted the heavy showers and we left Vielha in the cool, damp air but without rain. We were 'misted' upon several times on the climb to the Col or summit, though towards the end it was a steady mist. The increasing grades triggered increasing sweat which made donning rain gear unappealing and we pressed on to the top hoping that our clothes would not become saturated. The mist was a little lighter at the unremarkable summit and we settled for covering our damp shirts with jackets as we expected the drizzle to clear as soon as we dropped a couple hundred feet in elevation. Instead of the temperature rising as we descended it decreased and we soon stopped for heavier gloves. The lower we went the heavier the precipitation became but we kept riding instead of bundling up. Our plans for a celebratory picnic lunch at the crest and then part way down went by the wayside, as did stopping to put on more clothes. By the time we arrived in town, chilled and well-misted, we were anxious to retreat to our hotel room that was hopefully still radiating some warmth from the previous day's heat. Removing wet though not saturated socks and shirts and eating in our comfortably warm room wasn't enough to shake my chill so I took Bill's suggestion and resorted to a mid-afternoon bath. Steam roiled up from the smokin' hot water--something not always available midday in Europe--and I could hardly wait to dive in. Waves of shivering gripped my body as I slowly warmed in the just bearable heat. After about 10 minutes and 3 or 4 spasms of shivering, I knew I had shaken my chill and clearer thinking would soon follow. Once in France we continued our regime of alternating activities by hiking the day after biking over a pass as a relative-rest day. In Bagnères-de-Luchon that routine dictated we ride their cable car to the top of the line for a scenic (and warm) day of hiking; the next day we would be grinding up the pretty though not stunning Col de Peyresourde. Our pattern of alternating riding and hiking was paying off and after Day 10 of the regime my legs were ready for the toughest climb we'd do, the Col du Tourmalet. Unfortunately, another pattern began emerging too, which was cresting the Col's in saturated clouds. Beginning one of many chilly, view-less Pyrenees descents. We left Vielha in foul weather but on the next 3 passes we'd only encounter the clouds and drizzle once we reached the summits and then the gray overcast would be with us for the rest of the afternoon. That meant ending many a riding day with a chill and feeling cheated out of hard-earned panoramas. And since we hadn't found the Pyrenees to be all that scenic, the mountains were losing out on much-needed marketing opportunities. Unfortunately our best laid plans for a layover hiking day between Col d'Aspin and the tougher Col du Tourmalet fell through due to a lack of conveniently situated lodging and markets. While shivering through lunch after a cold descent down Col d'Aspin and discovering the services problems we reluctantly decided to abandon our hiking day: we'd make do with our food reserves instead of shopping and we'd ride the 2 passes back to back for a total of 7,000' elevation gain in 2 days. We felt courageous tackling these passes 2 days in a row but in a few days the Tour de France riders would be including them both in a single, long day's event. The next morning we were meticulous in pacing ourselves up the notorious Col du Tourmalet since we'd missed our rest day and we indulged in frequent, short stops and frequent, small snacks. Incredibility the persistent 10% grades over the last few miles that we'd seen reported by several sources didn't materialize and we cleared this second pass, Tourmalet, in fine shape. A couple of percent grade one way or the other in the 10% range can make or break us, so the slightly lower persistent grades were a huge help. However when we rode again in 2 days after a hiking day we learned that the back-to-back passes had taken their toll and the more ordinary 2,200' climb we were doing was daunting. Fortunately, we were lined up for a string of unavoidable rest days. At Col du Tourmalet I was thrilled to at last see some women riders and several other cyclotourists as both groups had been conspicuous in their absence for most of our time in the Pyrenees. Though by the time we exited the Pyrenees I realized I'd seen far more women driving support vehicles for their male cycling companions than women on bikes themselves. I quietly hoped that my gray-haired presence on a loaded bike might inspire a few of the women to push for equal time in the saddle being supported by the men next year. Northern Europe doesn't lack energetic female role models for younger women but the more southern reaches certainly do, which I find disheartening. An unexpected & lively welcome at Col du Tourmalet. These 2 passes stood out for a couple more reasons too. 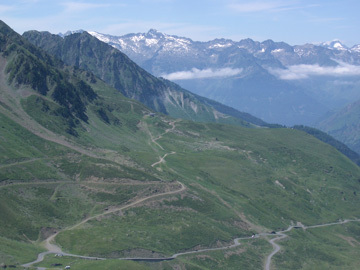 One was the incredibly unexpected dog attack that Bill experienced going up Col d'Aspin. Bill was still catching up to me after making a roadside pit stop when I heard the dog barking at him that had barked at me as I had passed by the farm. Later I learned that the dog had charged Bill, who fended off the attack with his telescoping walking stick that we now each keep in ready for such events. The dog had the advantage as Bill was on a steep uphill but he both wielded his stick in the nick of time and a descending rider stopped to further distract the dog. The unloaded downhill rider safely zoomed off after Bill escaped uphill at a snail's pass. Presumably this dog wouldn't be allowed to pester the Tour de France riders coming through at the end of the week. And finally on Col du Tourmalet we experienced a bit of the buzz at the top that we've come to expect from climbing passes in the Dolomites. 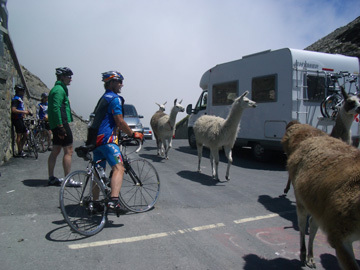 Perhaps it was the Tour coming through soon or perhaps it was typical of Col du Tourmalet in the summer, but the summit was intermittently swarming with cars, bikes, and critters. The sun came out for us on this pass and we enjoyed watching the festive atmosphere, visiting again with a Dutch cyclotourist with whom we had chatted on the way up, and ate yet another snack. We like to linger at the top of a pass to savor the panoramas and it's always more fun if there are others doing the same. The ride up to and down from the Col du Tourmalet was the first really scenic Pyrenees pass we'd ridden and the taxing, non-pass ride up the dead-end road 2 days later to Gavarnie was even better. We were going to Gavarnie for the hiking but the bike ride there was a visually delightful blend of scenes ranging from charming villages to small but deep gorges to mountain peaks. No doubt about it: the cirque at Gavarnie was stunning. Bill had originally planned a week of hiking at Gavarnie but that would have had us overlapping with the Tour de France when we left the area. He reluctantly compromised on 3 nights at Gavarnie, which turned out to be enough. 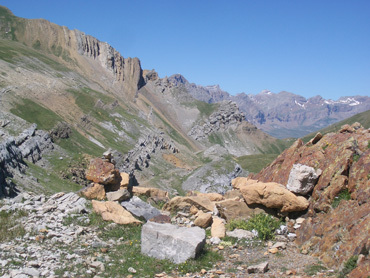 Like elsewhere in the Pyrenees, the hiking opportunities at Gavarnie came up short. There is a single, bona fide 'must do' walk up the glacially-carved cirque but there wasn't much more that was tantalizing--the several tempting higher elevation and longer hikes required mountain climbing gear. We settled for a short hike with views of the cirque on our arrival afternoon; the stunning walk on the 'must do trail into the cirque the next day; a no-view fitness walk up a steep trail in the rain and overcast on our last day, and then we headed out. Gavarnie is definitely a worthy destination for a day trip but it lacks the network of trails we'd want for a return stay. The folks managing several of the hotels in Gavarnie were notably unpleasant, also making it less inviting to return. 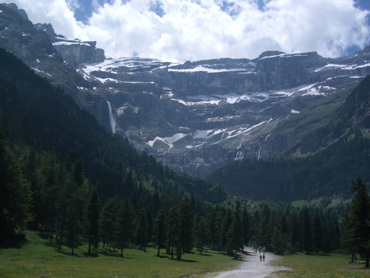 So, Gavarnie was another high-potential destination on our Pyrenees itinerary that we considered as finished business. Our intent had been to avoid the Tour de France this year rather than watch it in person as it creates headaches for us in the form of road closures and competition for lodging. We'd also learned from our previous experience that the Tour is more interesting on TV where one has the benefit of commentary about the unfolding race strategy versus seeing the pack whiz by in a couple of minutes. While it was critical that we not significantly overlap with the Tour's route, we did watch them fly by where our routes momentarily intersected. After suddenly abandoning our planned week of hiking at the end-of-the-road village of Gavarnie to avoid colliding head-on with the Tour, Bill spent hours on the internet developing an alternate route. He checked maps and schedules for the details of the Tour's route and lodging availability for a half dozen towns and cities. Avoiding being inconvenienced by the road race ultimately relied on the same strategy we used in Sicily on a national holiday weekend, which was heading for the cities instead of the tourist areas when the competition for lodging gets stiff. Crossing paths with the Tour here didn't cost us much time. Ironically we ended up waiting out the Tour in lowland Pau, the very city that most of the Tour teams were staying in for 3 nights. 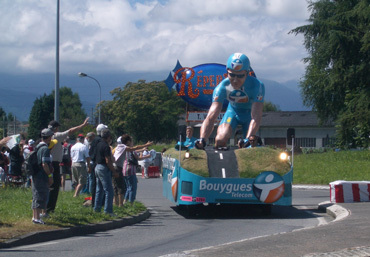 Unfortunately for us, they had a rest day while in the Pyrenees, which they also took in Pau. But Pau was big enough for all of us. We had to pay 'event rates' for our hotel room, but we were able to reserve in advance at a conveniently located hotel which allowed us to formulate a plan for the week. On the way to Pau from Gavarnie we stayed a night in Lourdes. It was just another stop of convenience, a place the right number of miles on the route with a room available; but visiting Lourdes turned out to be a paradigm shifting experience. Bill had read that Lourdes was a pilgrimage site but it proved to be like none other we'd visited. We'd traveled several parts of the heralded trail to Santiago de Compostela and visited the church there; we'd been to Assisi; and to Papa Pio's shrine and others, but none was like being at Lourdes. The difference between these and Lourdes was like the difference between playing with matches and lighting a bonfire. Part of the 5 pm procession at the Lourdes campus. Lourdes is the site that celebrates the mid-19th century visions and miracles of St Bernadette and mobs continue to visit in hopes of experiencing their own personal miracle. Five million people a year come to the acres of manicured grounds that include churches, healing baths, hospitals, and grottoes as a part of the modern monument to St Bernadette. 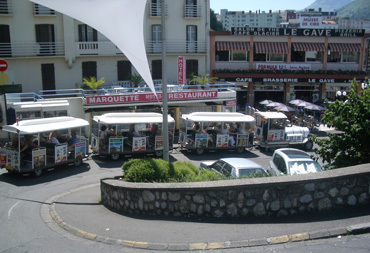 Tour buses by the dozens snake through the narrow streets of Lourdes as people arrive from all over the world. 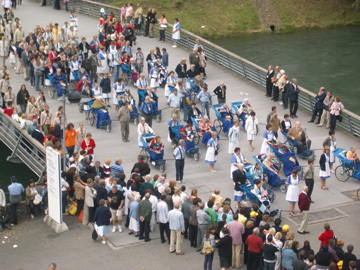 Seeing the circus-like quality of the trappings of Lourdes slammed against the desperate circumstances of some of the participants shook me to my core, especially knowing that some of the people had spent their life savings to be there. The crowds swarmed like at an outdoor festival and yet there was a very organized segment of it, which was the management of the disabled visitors. The disabled seeking cures were each seated in identical looking, decades-old wheel chairs and clustered into groups. Each wheel chair was pulled by an attendant in uniform who might be a Scout, a nurse's aid, or other official helper with a badge. Once seated and assembled, these visitors unable to walk the healing course were hauled around the campus for the ritualized process. I don't know the prescribed sequence, but we saw them at the 5 pm outdoor procession, in the bunker-like underground basilica that accommodates 20,000 people, and being drawn up the ramps of the cathedral. In addition to the infirmed that formed caravans on the massive sidewalks, there were thousands of other people visiting the various sites. This was a jubilee year, with the Pope offering plenary indulgences. Unlike the indulgences we've read of in the past, this indulgence didn't require a big cash outlay. Instead, completing a short list of prescribed tasks printed in a multilingual pamphlet was sufficient. Nuns with their necklace disks for jubilee stickers. For the asking, any visitor could receive a plastic souvenir disk on which to apply award stickers as they made their rounds to the 4 most potent sites. A little brochure gently suggested the appropriate prayers to recite or actions to take on your approach to and at the designated stops. Candles could be purchased and donation boxes abounded, but there were no direct charges on the open grounds. We wondered how the faithful reconciled the mixed messages. There were attractive, multilingual inspirational panels hanging in the basilica that reminded people that their circumstance was unique and purposefully selected by God for them and additional reminders of the suffering Pope John Paul embraced. On the other hand, the believers were being supported by a well-oiled machine that ran them through the prescribed steps to increase their chances of a miraculous cure. Though I suppose that those are the naive questions of an outsider and that the people coming to St Bernadette's have reconciled the seeming conflict. I could identify with the desperation of the people who come to Lourdes looking for a cure. I too am a 'leave no stone unturned' person when confronted with health challenges and the medical professions have come up short. But as we struggled to take it all in as we stood in the throngs, we 'ran the numbers'. About 5 million people visit the Lourdes religious compound per year and the documented cure rate from visiting is about 1 person every 10 years. A 1 in 50 million chance that a huge financial sacrifice will effect a cure is terrible odds. We don't know the specific numbers but are confident that the spontaneous cure rate from incurable diseases is higher than 1 in 50 million. We know that there are well documented cases in which the body's of very rare individuals have successfully reversed irreversible diseases. 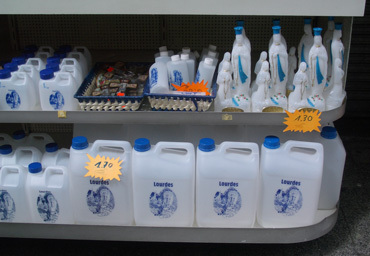 The holy water souvenir bottles were reasonably priced. Some well-studied AIDS patients have spontaneously been rid of the disease and some lethal cancers do disappear on their own. And most intensive care physicians have their own stories of patients for whom they had 100% certainty of imminent death but the patients didn't die. In our minds the fact that such extremely rare biological reversals do occur (without visiting Lourdes) speaks to the limits of the scientific understanding of the details of the diseases and errors in diagnosis. We struggled unsuccessfully to reconcile our own philosophies with those being demonstrated by the thousands of believers around us. The experience didn't undermine our biases but did deepen our understanding of what other pilgrimage sites were like in the past. Other pilgrimage sites that we've visited now looked historic, obsolete. They are no longer infused with the desperate energy that likely once surrounded them. St Bernadette's is clearly currently highly energized by the hopes and beliefs of millions and we'll put that overlay on historical pilgrimage sites we visit in the future to better understand what they were like in their heyday. 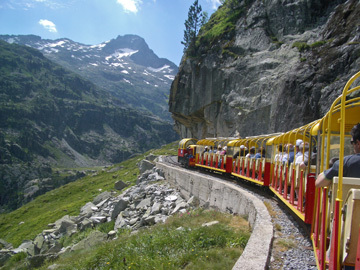 The tourist train trundled visitors to some of the sights. But while in Lourdes our contemplation of the plight of the many devote visitors and the serious questions the pilgrimage phenomena raised were frequently interpreted by the tourism overlay. Like in many buzzing tourist towns, we had to dodge Lourdes's little open-air train that drove visitors around town on a prescribed route. The 30€ ($45) ticket price included the train ride and admission to more Bernadette-related sites, like a wax-figured nativity scene, a wax-figured Last Supper scene, and an audio-visual Bernadette-story experience. This commercialization aspect plus all of the souvenir items, like plastic bottles and jugs for holy water, added to our difficulty in making sense of the whole scene. These trappings all served to make Lourdes look like a Disneyland knock-off but the seriousness of the illness of the people in town countered the impression though didn't resolve the conflict. Bill's sister commented that "People have always traveled for healing" which was a helpful observation to fold into the mixed experience. The ancient Greeks and Romans traveled to healing centers and no doubt unsatisfied tribal members before them knocked on the door of the next settlement's shaman when they weren't cured. And in our lives we've commented on several people we've known that should have traveled for healing but didn't, either for getting a second opinion or by visiting a larger center with more experience to have received more effective care. If you are in southern France, Lourdes is worth a visit to form your own opinion. 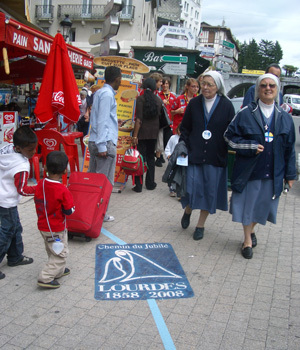 In the meantime, you can have your own virtual travel experience to St Bernadette's site by visiting www.lourdes2008.com. Select English and notice both the 8 photos available near the top and the webcam option in the lower right corner of the homepage to extend your experience. At procession occurs at least some days at 5 pm European Central Time, so 8 am PDT might be a good time to check on the action. Some nicely exposed geology above Panticosa. After too-long a layover in the French valley at Lourdes and Pau to avoid the Tour de France road closures, it was back into the mountains to complete our western Pyrenees tour. Bill's carefully planned though circuitous route took us back into Spain for the Col du Somport, some hiking at the Panticosa ski resort, and returning back into France via Punto del Portalet. The quality of lodging for the price was much higher in Spain so we relished the opportunity to cross the border again and enjoy cheerier rooms and better beds between cresting these passes. We saw ads for Le Petit Train of Fabreges-Artouste while still in Panticosa, Spain and knew it must be special to be marketed so broadly. Petit or little trains are a fixture of the French tourist industry though they certainly aren't limited to France. Lourdes had one, which like the others, hauls visitors around the city streets in a miniature open air train that navigates on tires instead of tracks. They are generally a win-win gimmick: they get some of your money and you get a quick and easy tour of the local highlights with little planning effort. The old route for the hydroelectric dam works. A little research spilled the beans: this little French train in the mountains ran on tracks instead of tires and its predecessor was used to haul men and materials during the construction of a Pyrenees hydroelectric dam. We detoured off the road from our descent down Punto del Portalet to check it out and hatched a plan for coming back the next day when the mountains weren't socked in with clouds and rain. We chanced the poor weather forecast and booked a second night in Laruns, our next destination town 12 miles downhill from the train. That allowed us to spend all of the next day making use of very limited bus service to travel back to the tourist site just to be passengers in the little train. Luckily for us everything was better than expected (except the hotel room): the weather cooperated by providing clear skies for a pleasant train journey and the views from the tracks were worth the time and effort. I especially appreciated being able to have the scenery scroll by me without having to look at my feet or the road surface as when hiking or biking. A pair of closely spaced passes in France, Col d'Aubisque and Col du Soulor, marked the end of our big bike climbs in the Pyrenees and they had some of the grandest scenery we saw in the mountain range. 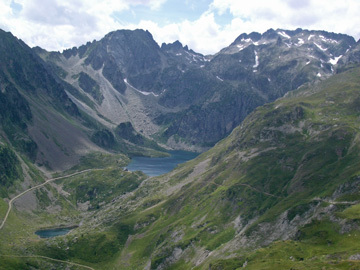 Next, Bill would give the Pyrenees one last chance to dazzle us with its hiking venues and we slogged up the hill to Cauterets after recovering from Col du Soulor. The grandest of the views from above Cauterets. Cauterets is one of the most popular French ski resorts in the Pyrenees and it has one of the few ski lifts or cable cars that operate in the summer months for hikers. 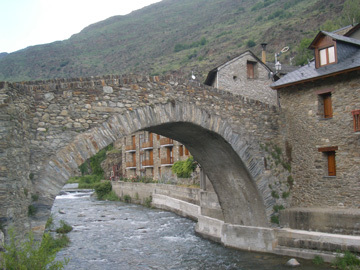 We spend 3 nights there for 2 days of hiking including the local favorite of le Pont d'Espagne and le Cirque du Lys. The hiking was better here than anywhere else we'd been in the Pyrenees for both the ease of identifying hikes to take and the overall scenic experience. But like elsewhere in these mountains, Cauterets didn't seem to have the week's worth of hiking venues we were in search of to energize a return visit. By the end of our 5 week tour of the Pyrenees it was clear that the Dolomites were far superior to the Pyrenees for meeting our ideals for great hiking and biking. It's a matter of personal preference and luckily for us we both preferred the same venue: the Dolomites. We delight in the exposed ruggedness of the rocks, the visible geology, the immediacy, and the wildly varied shapes and forms of the Italian Alps. The panoramas were more pleasing in the Dolomites, both from the saddle and when on foot. Checking out our road down off of Col du Tourmalet. Bill was systematic in sampling the Pyrenees passes from a biking standpoint though we were less thorough from a hiking perspective. There could be great hiking in the Pyrenees but it wasn't easy to identify as tourists blowing through the area whereas great hiking is easy to stumble upon in the Dolomites. And the Dolomites continued to take the prize for the vast network of hiking trails supported by an extensive network of cable cars that permit accessing dozens (hundreds?) of trails without needing a car. Comparable networks don't appear to exist in the Pyrenees and much of the hiking appears to be at the lower elevations in the forests rather than above tree line. Additionally, only a small percentage of Pyrenees ski resort cable cars operate in the summer months for the hikers. For our time and effort, the western end of the Pyrenees was the best part of this mountain range. 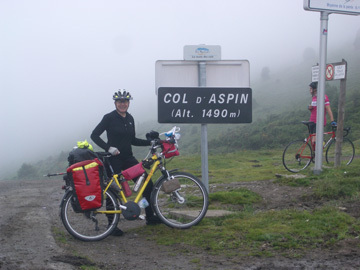 The areas around Col du Tourmalet, Gavarnie, Col du Somport, and Col d'Aubisque were the most pleasing to us and we enjoyed both the biking and hiking more in those areas than farther east in the Pyrenees. It was in this area of the Pyrenees that we found the views of the mountains more varied and more interesting, both when hiking and biking. Bill has a few more plans for the Pyrenees, so we'll be back. But the Pyrenees failed to do what we'd hoped they'd do, which is give us a second, top-notch mountain destination for summer hiking. We'll add them to the long list of places we are glad to have been but won't be rushing back to or visiting annually. Imagine that, we're in the Dolomites! Since arriving 10 days ago our energy and attention has been divided between scrambling up the stunning mountain faces for our beloved panoramas and wrapping up projects on our severely ailing laptop. Bill spent 2 hours last night just trying to get the #*/! computer to boot-up and stay up; when it was finally up, he was stuck being up himself 'til 1am overseeing the completion of some pokey tasks. So, the pressure has intensified: late last night we finished culling the last 500 hundred photos in our 2008 collection; Bill has the computer running as continuously as it will to backup files to an online archiving service; and I hope to get 1 more journal update onto our website before a final crash--computer that is, not bike. Our friend Mulvey will arrive on Saturday with a replacement memory chip ordered from the manufacturer that will hopefully solve one of the several computer problems. After he installs that chip, Bill will decide whether to gamble on limping along for 3 more months or sending the computer home for repair right now. Bill hardly needs another gizmo to keep afloat but that cute little 9" screen laptop that turned his head is suddenly looking like a necessity instead of a luxury--our "baby" (as we call our laptop) may get a little brother next year to extract us from this 'all or nothing' mode.